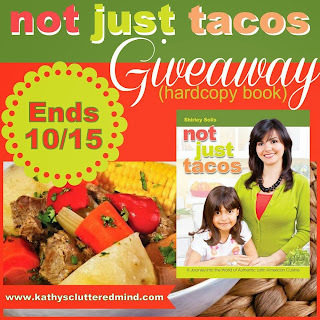 Several weeks ago I wrote a review about the Not Just Tacos cookbook which was also FREE for a limited time. If you missed the FREE eBook or perhaps love it so much you want a beautiful hard copy then you are gonna love this......Shirley is letting each blogger that shared about the FREE eBook promotion give away a hard copy. Shirley Solis has graciously offered to giveaway a hard copy of Not Just Tacos to one reader. All entries are optional, each entry option gives you more chances to win. This giveaway is not affiliated with Facebook in any way. The winner will be posted on the blog and will be emailed. Winner must reply within 24 hrs with their contact information or another winner will be chosen. Prize will be mailed via publishing company. I love cookbooks and am always looking for new things to cook. Thanks! I have the ebook, but I much prefer hard copies for recipes. My husband is Cuban and we love Latin cooking! We love ethnic cuisines and the recipes in this look amazing! I am really stuck in a rut with cooking and just doing the same things every week. I want to win because Latin American -- Mexican in particular -- is my favorite cuisine. I'd love to learn to make more of my own.